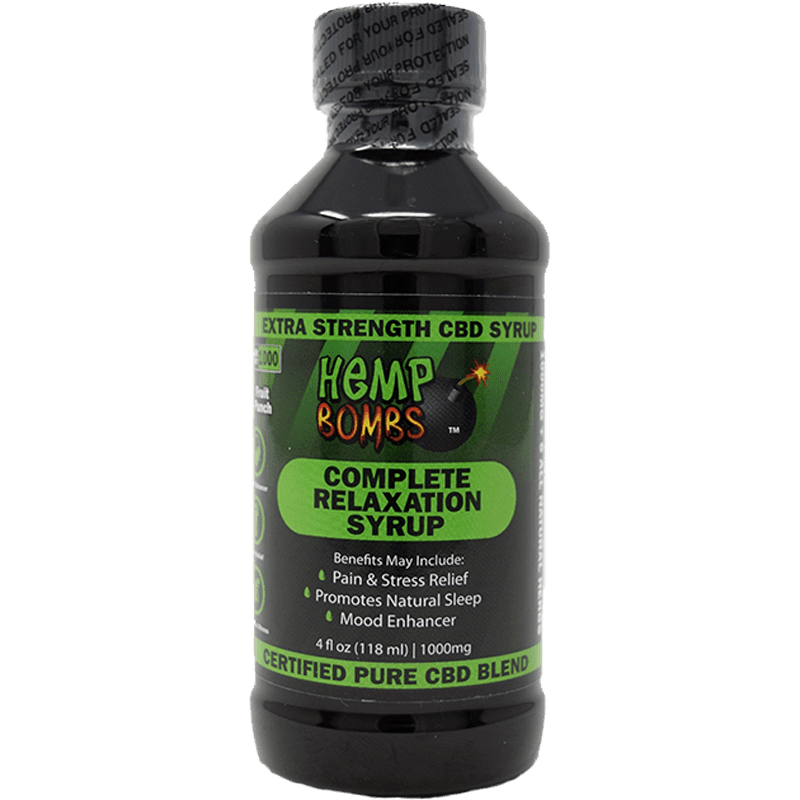 Hemp Bombs’ Complete Relaxation CBD Syrup is a powerful concentrate that packs CBD-derived therapeutic benefits into manageable servings. 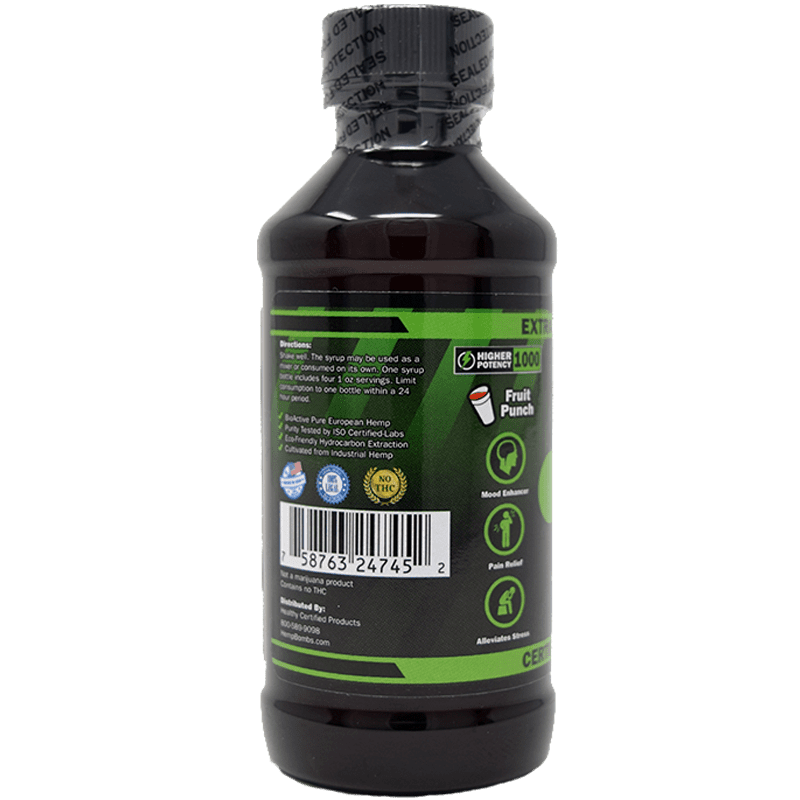 This product is perfect as a mixer, infusing a CBD blend into any drink to generate a wellspring of complete relaxation. The syrup is sourced from premium-grade, organic Industrial Hemp grown on environmentally friendly, non-GMO farms. 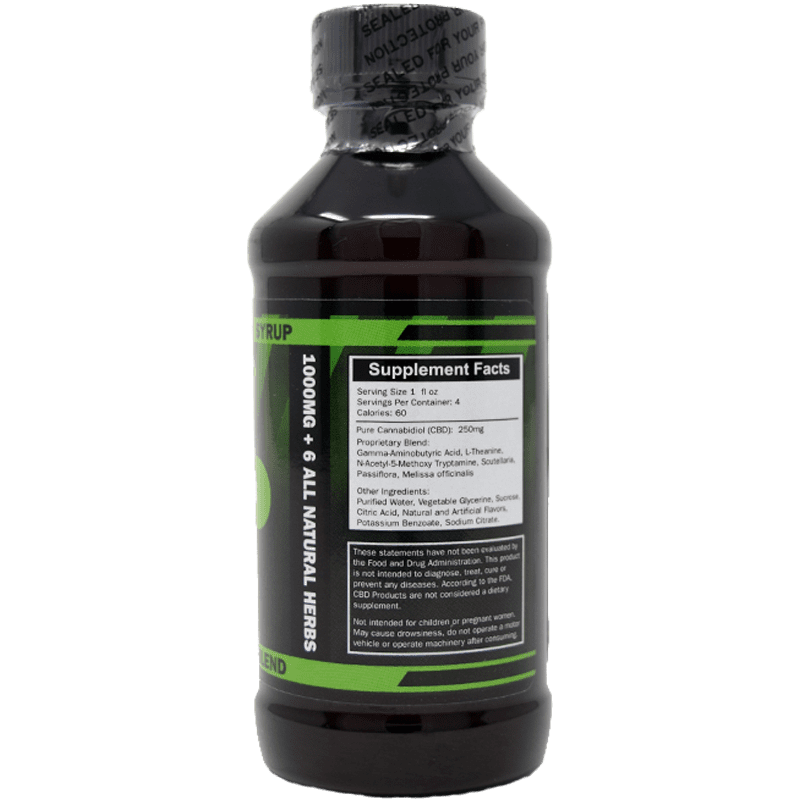 Hemp Bombs’ Relaxation Syrup is a natural product that may provide you with a wealth of benefits at an affordable price point. 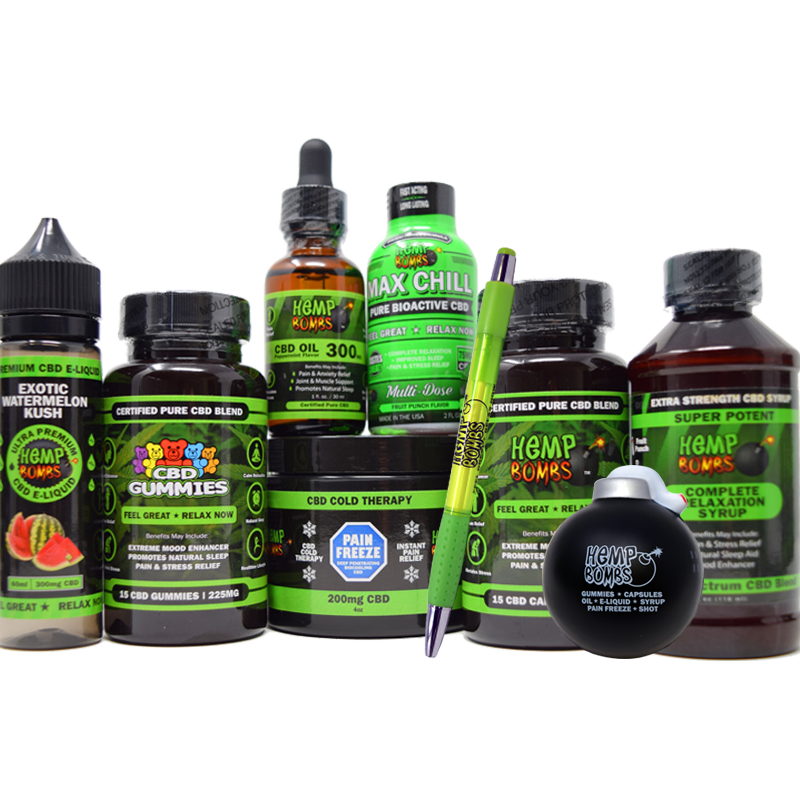 Hemp Bombs’ 1000mg CBD Syrup is our strongest syrup and contains a well-balanced blend of CBD and six all-natural botanicals. Formulated for maximum relaxation, our delicious fruit punch flavored CBD Syrup that can be mixed with a beverage or taken on its own. 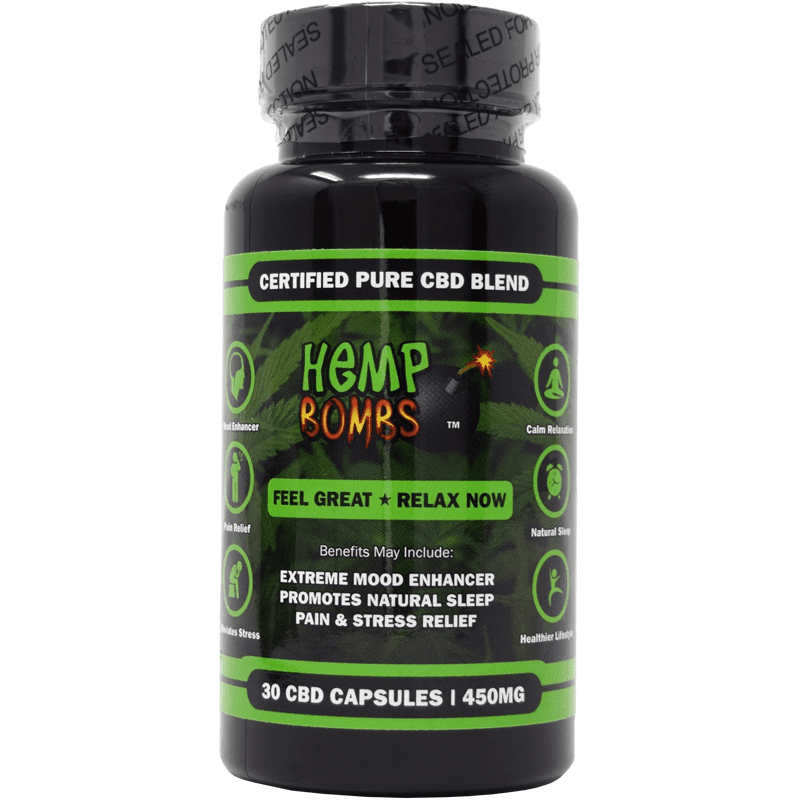 Hemp Bombs’ Complete Relaxation CBD Syrup formula encourages mood enrichment and a lasting sense of relaxation. Other potential health benefits may include pain relief, stress relief, and improved natural sleep. Limit four servings within a 24-hour period. CBD, or Cannabidiol, is a cannabinoid derived from Hemp or Marijuana plants. Hemp Bombs’ extracts CBD from organic, premium-grade Industrial Hemp. CBD has a growing reputation for its plentiful health and wellness benefits. As a cannabinoid, CBD positively interacts with the body’s Endocannabinoid System (ECS). The ECS is made up of cannabinoid receptors known as CB1 and CB2. CBD can greatly influence ECS receptors that control nervous system functions such as mood, sleep cycle, pain, and inflammation response. Soooo good. I sleep great on this syrup. 4 stars only because I don’t like the flavor alone, so I mix mine with orange juice just before getting ready for bed. By he time I hope into bed I can feel myself super relaxed and ready for the sand man. Hope they come out with different flavors soon. Much safer than the prescription meds, makes me very sleepy and relaxed. Works wonderfully for anxiety, pain and sleep! Been using CBD syrup from Hemp Bombs for the last few months and getting very good results. This purchase is for my sister-in-law. I hope it works for her like it does for me. Good product. Disclaimer: I HAVE NOT TRIED THIS PRODUCT YET… but it arrived in exactly three days!! It was so much faster than I thought it would be, I just had to write a review! I was under the impression this is a UK based company and expected that it would ship from there, so I wasn’t expecting it for 2-4 weeks! I will update, or re-review the product itself once I’ve tried it out for a week or so. Thank you! Why does the bottle say 4 servings/bottle but the breakdown here in this post says 1 tblsp & 64 servings /bottle. This put me to sleep so well and I slept like a baby…until like 4am when I had to jump out of bed with the runs. Had me on the toilet with my insides flowing like Niagara Falls 🙁 I guess I’ll keep using it though because it still helps me sleep better than ever. And it also works as a laxative so why complain? Just be prepared and watch what you eat before taking it. Those beef tacos weren’t a good idea. Nonetheless, thank you Hemp Bombs. i like this strong syrup the best out of the three. it tastes awful, but i can take it like a regular cough syrup, with a spoon, and it is a perfect amount. Strong, but OMG I love it. Great flavor, you only need a little bit. Holy cow this stuff is strong. But hey I’m not complaining, it works! I haven’t slept this well since i was a teenager. I wake up feeling good. I love the fruit punch flavor. I’m looking forward to other flavors. This syrup is so yummy and it makes me feel so refreshed. I mix my fruit punch syrup with fruit juice in the morning before school and I can stay focused all day. I just started using this product and already notice a huge difference in my chronic pain. I hope I can be off my pain meds soon. II love mixing it with lemonade because it tastes so good. I will order again. A nice lady in customer service told me about the cbd syrup. I am on my second bottle now. it works so I will keep buying. Thanks for an awesome product. Told all my friends and fam. Love this stuff! Helps w/ my anxiety and insomnia. If you’re like me and suffer, l recommend this for you. It works! Doesn’t taste real good, but works. 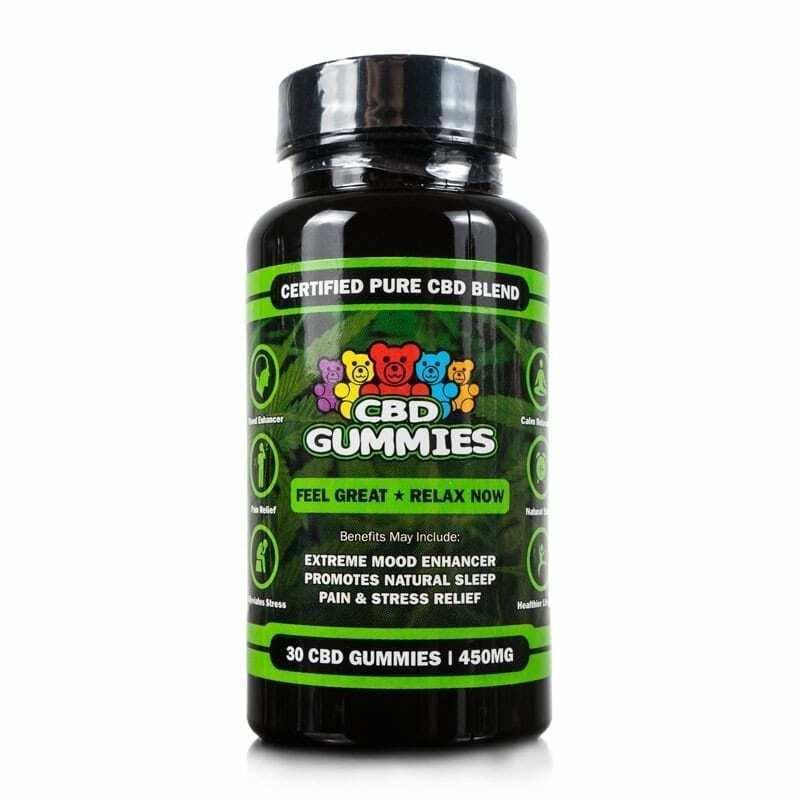 Excellent cbd product for sleep. I would highly recommend. Meh, didn’t really feel much. Maaaaaan, this cbd syrup knocks me out so good. I’ll be buying a lot more. I suffer from PTSD. I have not had any relief in so many years and to tell you the truth, I can’t even try to figure out when it might have been. I got this about two hours ago from a local shop in town. About 30 minutes ago it hit me and for once I’m not a nervous wreck. My muscles are relaxed and not tight. I don’t know if other people believe in miracles but I do and I can not say how grateful I am to have this in my home. Thank you! I’m really liking this. I have tired many similar products over the past year, this one is by the best I have come across online. The taste is pretty good which is an added positive. Very potent and works wonderfully for my panic attacks. I will most likely buy another one once this is out. Good quality. Fast shipping. Syrup works. I’ll buy again. Last year I was diagnosed with Crohn’s disease. My doctors put me on pills and Humira but all of it made the inflammation unbearable. I was starting to get desperate for some relief, so I ordered this since I saw your page facebook. The effect was practically immediate. The morning after I first took it, I got out of bed and had almost no morning stiffness, which is incredibly unusual. I also didn’t feel nauseous. I usually can’t have coffee because it makes my stomach flare up but 2 days later I felt well enough to some. It’s been a month now after I started using it and I’m feeling completely normal. I can eat again, no chills, no fatigue, etc. I can also finally get a good night rest. If you suffer from any sort of inflammatory issues, do NOT hesitate to at least give this stuff a try. It only takes 20 min for my anxiety to calm down and I always sleep amazing. This 1000mg syrup is definitely more effective than the others you offer. Love the way is relaxes me before turning in at night. I sleep all night. I switched to this high potency version shortly after you started offering it. Glad I did. It works better for sure. This syrup rocks! I’m addicted. My back pain is so much less now and I can walk much easier. Thank you! I have been using it sparingly for 2-3 weeks. I was skeptical at first but I find that I am sleeping better and longer when I take it. 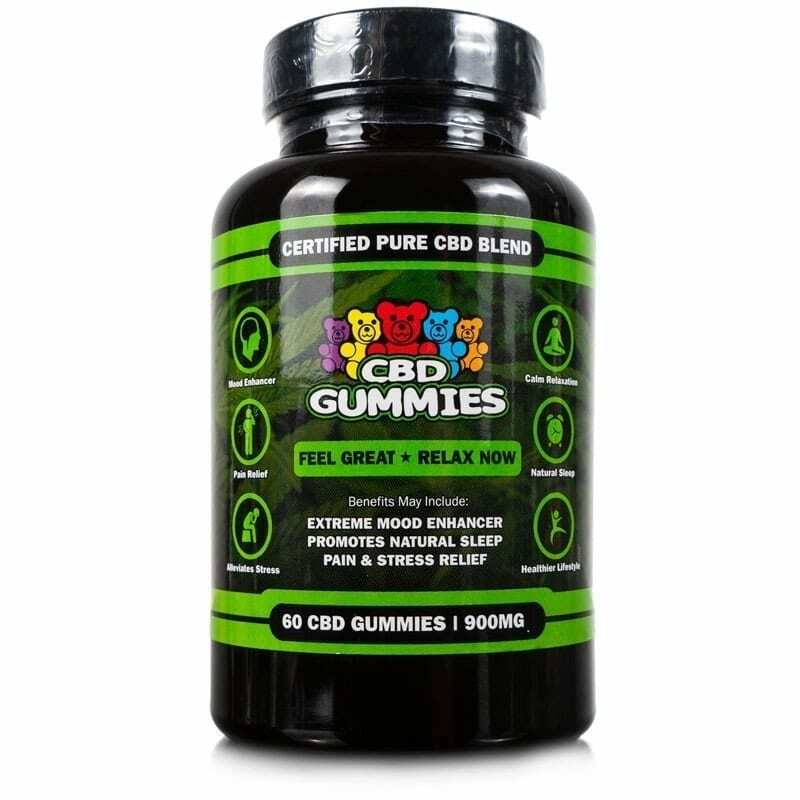 After trying out many of your other excellent CBD products, this one does the best for me. Can you make a bigger bottle? Bought this and not sure how to use it but can’t wait to try it. Does it go under my tongue? Or mix in with liquids only? Hey Hemp Bombs, just wanted to say your cbd syrup is helping with my chronic back pain issues. Not much else has worked and I was really reluctant to try it but it is making the pain much less. This is the only strength I’ve ever tried so I can’t compare it to the others you offer. I really like it and will continue to use and try Hemp Bombs products. I believe in the company. Do your homework. These guys truly know what they’re doing. Great product! I use it for sleep. I drink it straight, no mixing with anything. wow. i’m in love. i love taking it before bed. Giving you 5 stars for helping me with my severe leg pain. It is so bad some days it’s just hard to walk at all. Now with your CBD syrup and have almost zero pain and that makes me a very happy person. I actually feel like I have my life back from this product. I hate to say it’s a miracle product but it is really working super for me. Thank you so much! Let me tell you this is better than sleeping pills, No-Dose or Nyquil. All of those leave you feeling like #%$& in the morning when you wake up along with side-effects. For me, it just helps me get to sleep quicker and keeps me a sleep longer. Good stuff. I’ve been mixing it in with apple juice and taking it in the morning with breakfast. Thanks for upping the MG on the cbd syrup. It came in last week and it is stronger than the other for sure. We’re liking it. Yay! Great idea to make this stronger! I like it!